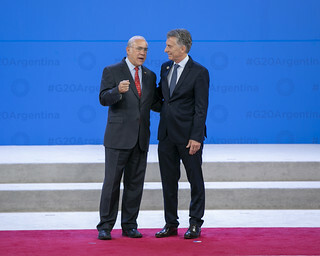 01/12/2018 - International cooperation and collective action are critical to tackling the world’s major challenges, OECD Secretary-General Angel Gurría said following the G20 Leaders’ Summit held in Buenos Aires amid heightened trade tensions but at which important advances were made on a number of priorities of Argentina’s presidency. In their final communiqué, the leaders agreed on the need to prepare for the way the world of work will change in the future, on building infrastructure for development, on food sustainability and on a range of issues vital to improving people’s lives such as gender equality, fighting corruption, adapting to digitalisation and creating a fairer international tax system. The OECD and a number of other multilateral organisations made important contributions on specific policy areas. The work was recognised by the leaders in their communiqué which declared that building consensus requires the commitment of society as a whole. Mr Gurría spoke to the Summit on issues reflecting just a part of the broad range of support to the G20 on policy design, evidence-gathering, standard setting and monitoring undertaken by the OECD. On the challenges posed by digitalisation in the area of taxation, Mr Gurría said a consensus solution is within reach, “the G20 needs to show unity and commitment” to achieve it. The OECD report on the issue will serve as a basis to find an effective response by the target date of 2020. Despite differences between countries on a number of issues, particularly on climate and trade, the progress on reaching agreement on a broad range of policy areas was welcomed by OECD Chief of Staff and G20 Sherpa Gabriela Ramos. An overview of the OECD’s contribution to Argentina’s G20 2018 presidency is available at https://g20.org/sites/default/files/buenos_aires_leaders_declaration.pdf. Further information on the OECD’s work for the G20 is available at the www.oecd.org/g20; or from the OECD’s Media Office (tel +33145249700).